Happy Thursday, y'all, and hope you enjoy today's musical outing. One of the fabulous groups of yesteryear had a top twenty hit with this little ditty, whose vibe (and video) I'm still feeling thirteen years later. 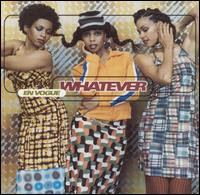 Trivia: One of the great originals of its day, the female soul group En Vogue originally began with four members, and scored hits with their jazzy throwback tune "My Lovin' (You're Never Gonna Get It)" and "Whatta Man" with Salt N Pepa, the latter of which reached the Billboard Hot 100 top ten. During the recording of EV3, which featured arguably the group's biggest hit, "Don't Let Go (Love)," group member Dawn Robinson decided to leave the quartet, although her vocals still decorate a majority of the album. Robinson later rejoined the group in 2008 as they began to slowly tour the U.S. and supposedly record an upcoming new release.